It’s almost that time of year again! The wonderful time where each and every neighborhood is magically transformed into its own Halloween Town. Don’t you want to be the patron spirit of Halloween in your hometown? Of course, you do and we have the perfect costume to make you exactly that. Feast your eyes on this amazing Teen Jack Skellington Costume. Once you toss on this stylish black pinstriped jacket with a pair of black pants, you will start to feel a surge of Halloween spirit shoot through your veins. Add the ascot and Jack’s signature bow tie, and you’ll be more than ready to give everyone a Halloween experience they’ll never forget. Although there is one thing you still may need to take care of and that is your fleshy face and hands. No worries, though, just take a look through our accessories and add a pair of white gloves as well as a Jack Skellington Mask to your cart. Once you’ve covered all visible skin, your transformation will be complete. You will be the Pumpkin King! Find your dearest friend and have your very own Sally. The two of you can enjoy singing and dancing, up and down the streets this Halloween. 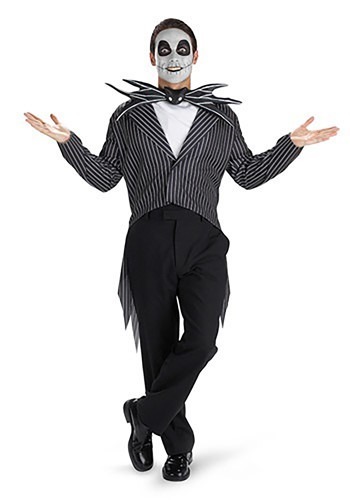 Have your Halloween on Christmas or on any day of the week when you have this awesome Teen Jack Skellington Costume. Become one of Tim Burton’s most iconic characters and show everyone how Halloween Town celebrates this amazing holiday!